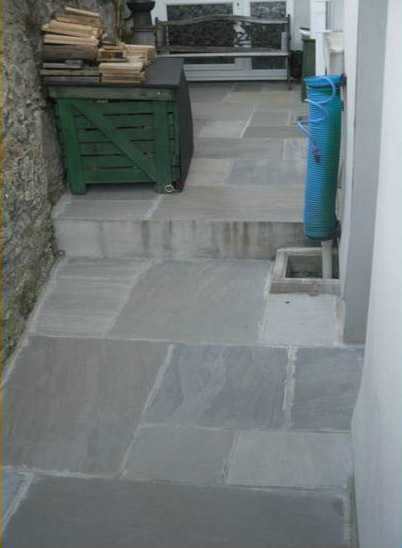 A complete makeover we carried out for a small courtyard to a Victorian house in Plymouth. 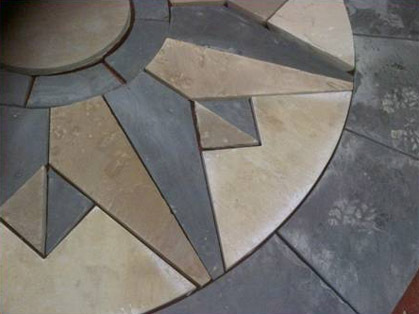 The owner wanted to use a grey coloured Indian sandstone for the paving and also wanted a circle design for its central feature, but did not like any of the designs available on the market, so ideas were discussed and eventually a design was agreed for us to cut out of sandstone ourselves. 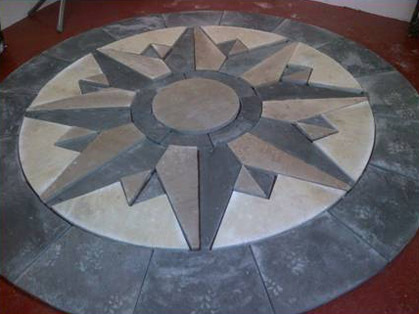 The design was based on a compass rose. 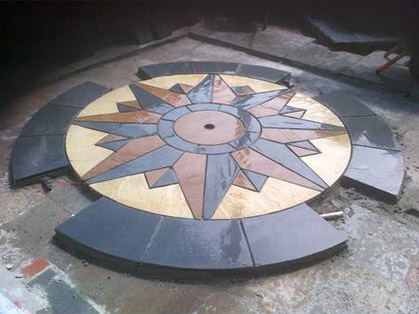 First we drew out the compass design on a workshop floor and made templates to ensure every piece of stone we cut fitted perfectly into the overall design. 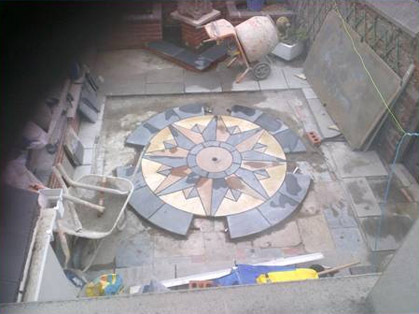 We then went about cutting the individual pieces of stone using the templates and laid them out over the workshop floor so it all fitted together before it was laid in the courtyard. 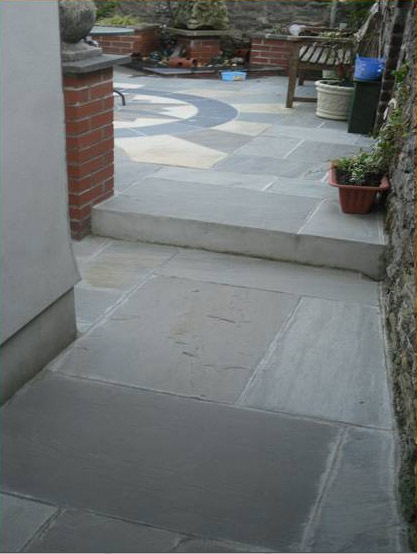 We used two different colours of Indian sandstone, yellow and brown and a Chinese slate called ‘Midnight Blue’ was introduced as a third colour to create the overall effect. The templates are stored away for another day should anyone wish to have the same design, all the hard work in setting it out is done. 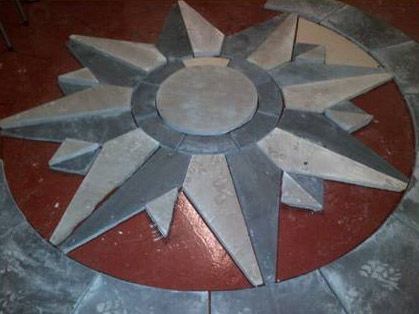 It gives the compass rose a 3D appearance. 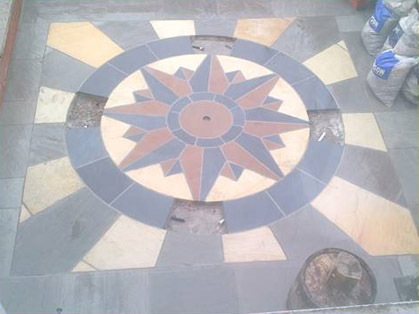 The compass rose points North and the four points depicting North, East, South and West have LED lights fitted into the slate and one in the centre of the rose. 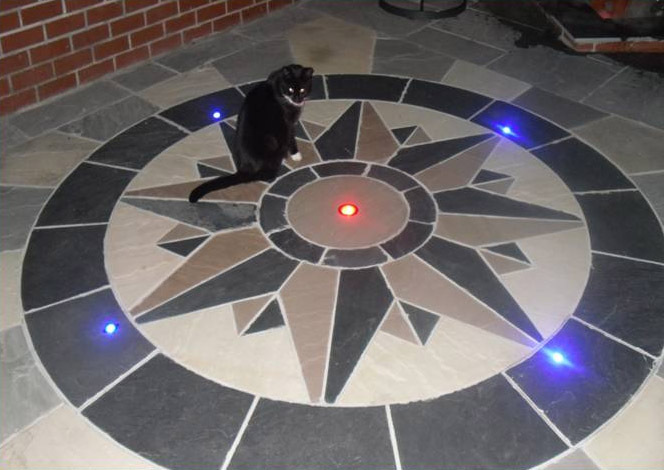 The LED lights are all IP68 rated which mean they are fully submersible as far as water is concerned and they have colour changing capability. 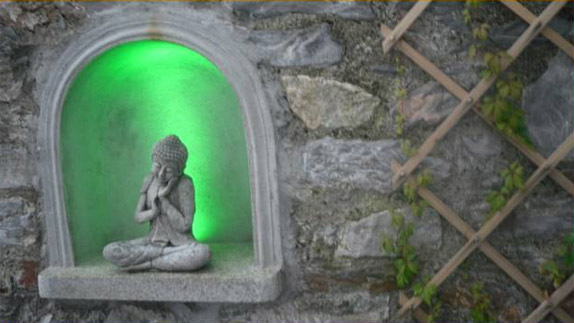 They can be operated from a remote control and all the electrical work was carried out by a certified electrician. 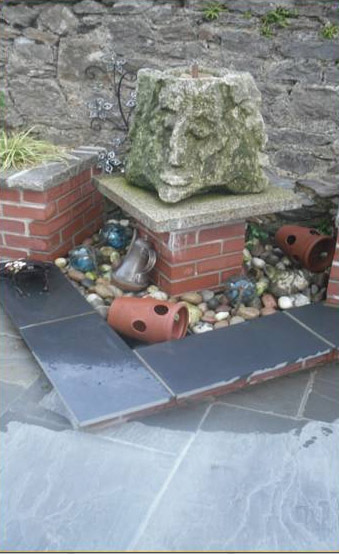 A water feature was built which consisted of a block of granite that had four faces carved into each of the corners of the block. This sat on a slab of granite on top of a brick pier, the water cascades down over the faces of the granite and into the pebbles below. 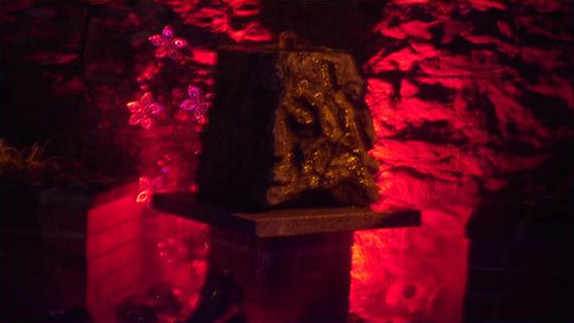 The water feature also has LED lights set in behind it, again with colour changing capability, the lighting colours are almost limitless. 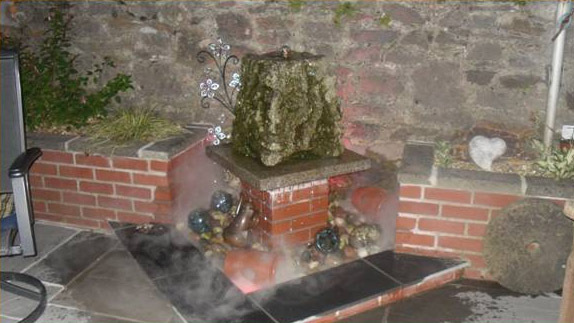 Also the water feature had a ‘mister’ or ‘fogger’ set in underneath the pebbles which creates volumes of mist and gives an air of mystery as the mist seeps up through the pebbles. 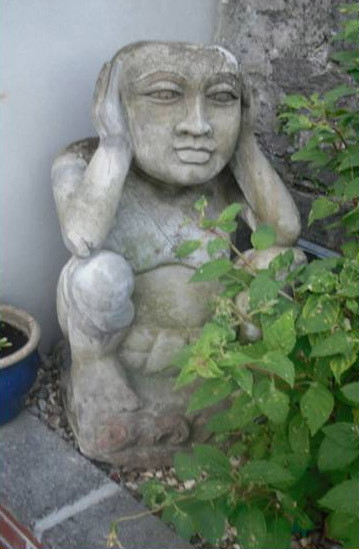 A figure carved out of some kind of volcanic stone sat amongst the shrubs in a raised planter, his name is ‘Nobby’, it’s not sure where he came from originally but is thought to of came from somewhere in Asia, he is actually one of three. 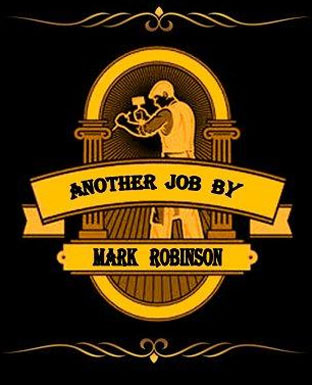 ‘Nobby’ is ‘Hear No Evil’. 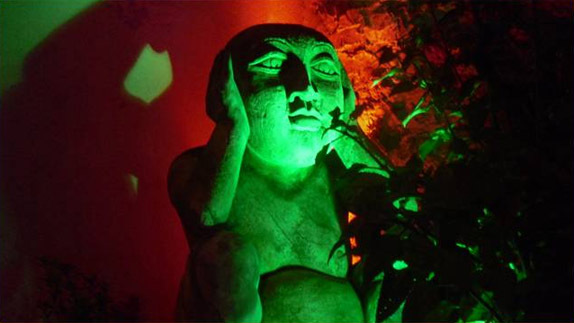 And with some hidden lighting, at night, ‘Nobby’ comes to life. 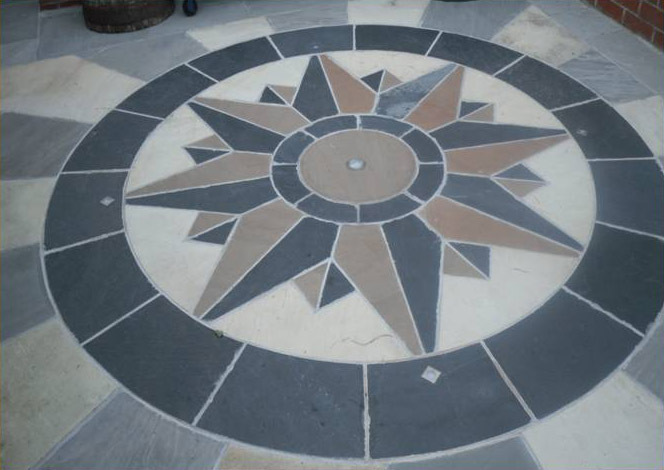 The grey sandstone paving around the compass rose came in five different sizes. 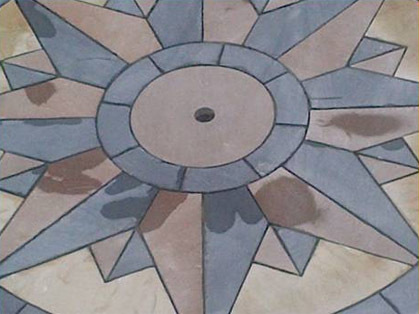 It was laid in a random pattern and carried on around to the side of the house. 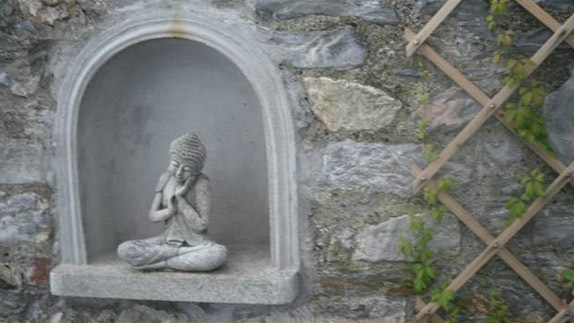 We also cut out a hole into the garden wall and created this niche complete with a granite sill. This too had LED lighting set into the back of it.